You are currently browsing the Archaeofacts.com archives of Musings for the day Monday, November 10th, 2008. Driving through a place, and maybe stopping and walking around a bit, you get an impression of what the place is like now, and something of its past. A year ago, we were walking around Greenville, PA, in the northwestern part of the state. My overwhelming impression was of a community undergoing economic and demographic contraction, yet trying to keep the downtown from total disintegration. What wasn’t apparent, of course, were little historical details, such as who wandered into this long-standing and still-operating restaurant on the main street downtown. Fortunately, we have the vast resources of the internet, which says that the inventor of a parachute (like a funky umbrella) used by WWI pilots, lived here and worked as a coal miner. It seems a good bet that he visited the Majestic* once or twice. 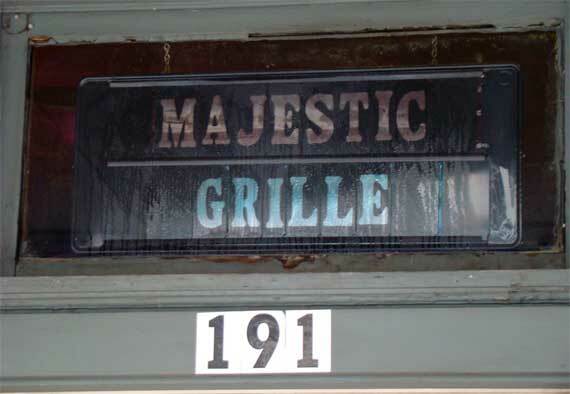 * Not to be confused with the Majestic Diner, on Ponce, here in ATL, which has been open since 1929 and serves a mean breakfast. Posted in anthropology | Comments Off on Who ate here?